Times tops at Ladakh, and certainly with no regret. While the pastoral communities relish on the serenity of Ladakh, tourists travel into the tranquility of the region to escape from the everyday bustle of their lives. The land comes exceptionally alive during the autumn season, especially from 1st September to 15th September, during the annual Ladakh Festival. The festival is a unique opportunity to witness and experience the rich cultural ethos of the people who have lived for centuries on the crossroads of Asia, assimilating and harmonizing socio-cultural and religious influences from their neighboring societies. Ladakh Festival, a project by the Jammu and Kashmir State Department of tourism, aims at reviving and exhibiting the opulence of Ladakh’s centuries-old culture, traditions and folk heritages. A spectacular procession at Leh commences the two weeks of celebration. 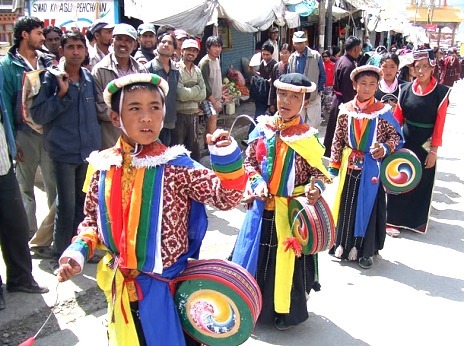 Diverse cultural troupes and village contingents participate in ceremonial costumes, singing songs and performing various types of dances to the tune of the traditional orchestra. The parade ends at the Polo ground, where the participants break into another round of folk and popular dances demonstrating the finest illustrations of the region’s performing arts. The polo ground also hosts the popular Polo tournament where polo teams from across the region compete for the “Ladakh Festival Cup”. Another fascinating programme is the staging of typical Central Asian Trade Mart, in Leh Bazaar. The event is marked by traditional caravans laden with trade goods, with skilled artists dressed in period-costumes playing the roles of merchants engaged in trading, bartering and associated activities. The most adrenaline driven event though, is the village archery festivals held in selected suburban villages of Leh. It is mandatory social code for all villages to participate in these events and they do so with much panache and élan. Like the American soccer, men and women enjoy their respective roles. While the male participants try their skills with the bow and arrow, women cheer them in every round with fold dances. The Ladakhi Polo is a display of the power and precision of horse and horseman. With tougher and stricter rules than modern polo, Ladakhi polo is played in a swifter and more intriguing manner against the rugged hills of Himalayas. Contemporary affairs like motorbike/cycle expedition to Khardung-la, white-water rafting expeditions and treks and Thanka painting exhibition have also become part of the Ladakh festival. 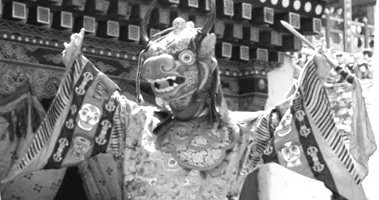 Music, colorful mask dances of selected monasteries and mock marriage ceremonies also commemorate the two weeks of revelry. The Mentog Stanmo or the flower dance from the Wakha, Mulbek and Nubra Valley is another highlight. Performers dressed in traditional robes hold a bunch of freshly-plucked flowers and dance to welcome the season. The chang dance has men balancing the chang (local rice beer) brass jugs on their head while moving to traditional beats. Amongst the communities who arrive here for the inauguration, it’s the beautiful Drokpas (or Brokpas) from the Dah Hanu region in Kargil who stand-out for their chiselled Indo-European features and distinct headgear, which comprises a bunch of fresh flowers worn by both men and women as well as extensive silver jewellery. The community, it is said, is the purest Aryan tribe in existence. 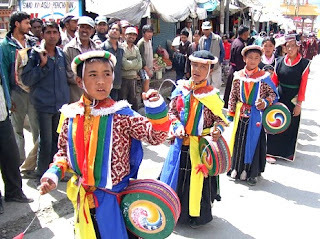 Ladakh Festival is simultaneously celebrated in different parts of Kargil district. Traditional archery tournaments, besides cultural programs form a core part of the festivities. The presentation by Brok-pas community depicting the land’s ancient social customs and ceremonies is usually the highlight. The game of polo, the ancient sport of the Dards of Dras is also something to look out for. Similar programmes are also held in Zanskar Valley, where the high point is the traditional sport called "Saka", in which a number of colourfully attired horses are used in a quaint racing competition. The Ladakh Festival is an absolute cultural extravaganza. It is a time when the colorful yet halcyon land of Ladakh tucked away in the chill of Himalayas comes out with vibrant burst of vitality.